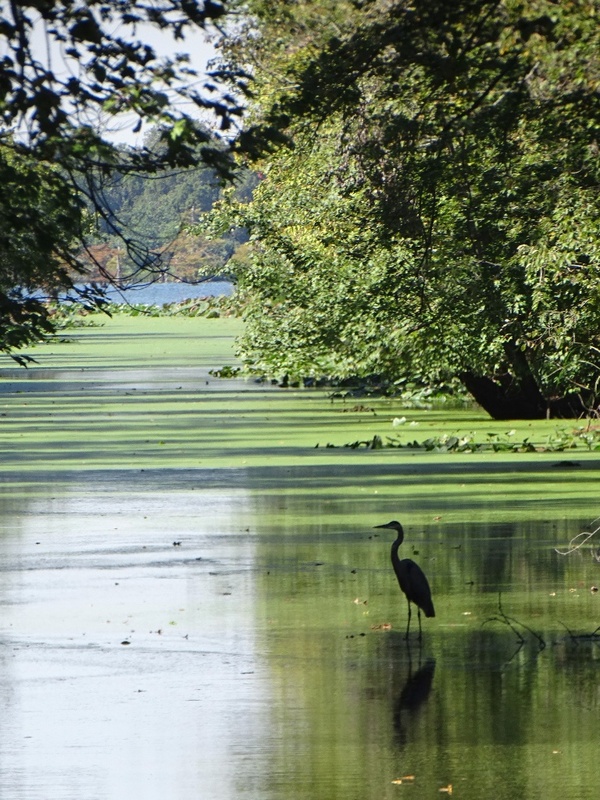 We spotted these blue herons standing in the floodwaters of Reelfoot Lake. Due to excessive rain during the past two months, the lake, which is usually out beyond the tree line, has spilled over its shores. On one of our recent drives along the Mississippi levee, we came upon what appeared at first to be a tranquil scene. A colony of great egrets, intermixed with a few graceful geese and a great blue heron, was foraging in the shallow water of a flooded farm field. We sat and watched the peaceful scene for some time. Then we spotted it. Sitting on the far shore of the water was a bald eagle, obviously hoping to intimidate and pick off a weaker bird. After further observation, we spotted a younger eagle sitting high atop a nearby tree. It was intently keeping a watchful eye over the adult’s progress and encouraging it on. What had appeared to be a predator in search of small fish or frogs, also turned out to be the potential prey — a hopeful meal for some hungry eagles. Such is the drama of nature. A leisurely drive along the Mississippi levee at this time of the year never disappoints. One of my favorite sightings this month was several Ruby-throated hummingbirds darting in and out among the red clover. We sat and watched their playful activity for some time. No photos, but clear, beautiful images in my mind. 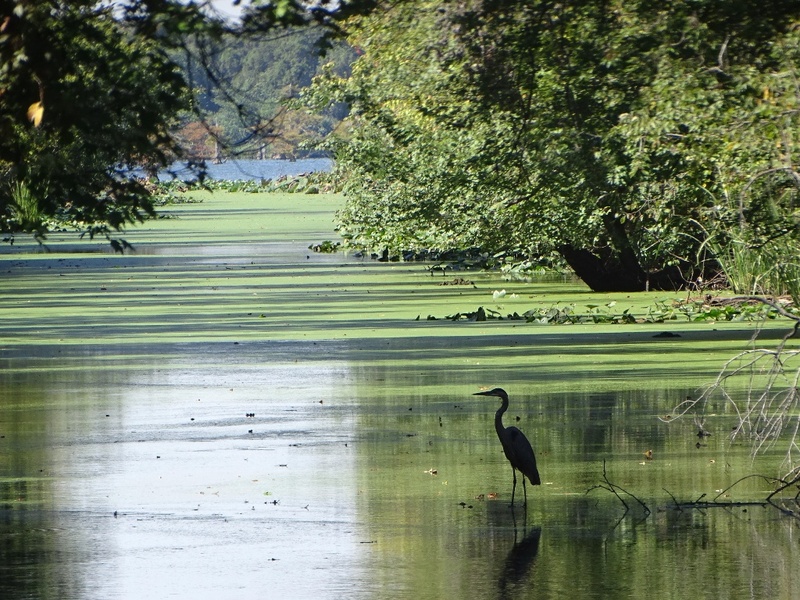 We spotted this Great Blue Heron along the Reelfoot Lake spillway. Its mind was singly focused on one thing — catching lunch — which it promptly did, and swallowed whole. When I first arrived at the boardwalk, I could see this heron at a distance out past the trees. I thought that my presence might spook him and cause him to fly away. Instead, to my amazement, I saw him take flight, settling in a spot closer to where I was standing. As I watched, he casually snatched a couple of tiny fish out of the water. Then he remained in his chosen spot, watching me as I walked up and down the board walk. As we drove past this inlet, we spotted a Great blue heron standing motionless in the shallow water. We backed up, stopped, and enjoyed the beautiful scene. Due to heavy rains, the Mississippi River recently overflowed its banks and went beyond the tree line. These photos were taken on the levee near Tiptonville, TN. Rain water also encroached on the land surrounding Reelfoot Lake. This brought some animals in closer than they might usually come.